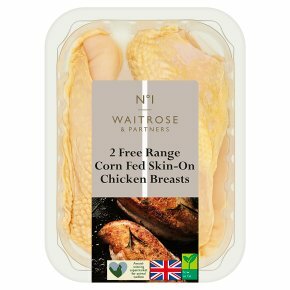 Our free range chickens are reared exclusively for Waitrose on small, family farms in Northern Ireland. By day they are free to roam in open pastures and exhibit their natural behaviour. By night, they are protected in purpose built sheds and are fed a natural, cereal based diet. Pan Fry. Time: 15 - 18 mins. For best results pan fry. Remove all packaging. Heat 1 tablespoon of oil in frying pan, add chicken, cook on high heat to seal, turn and seal other side, reduce heat until thoroughly cooked, the juices run clear and there is no pink meat.